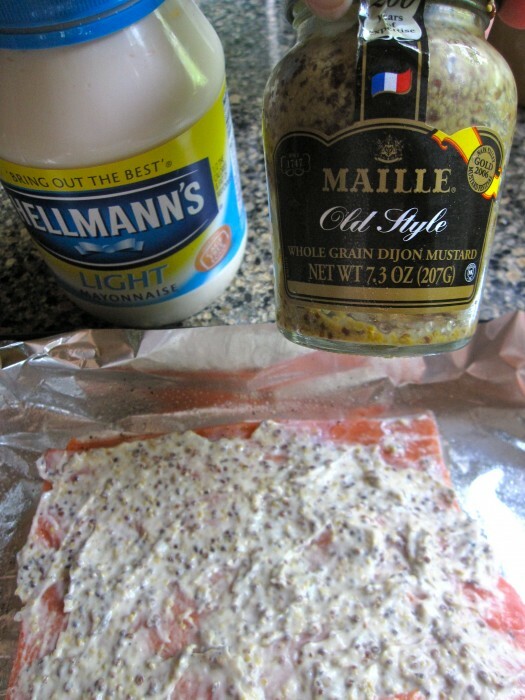 Combine mustard and mayo and spread over salmon before cooking. Combining mayonnaise and Dijon mustard, then spreading the mixture over fish fillets prior to baking, is a simple recipe mom often made for us, way back in the prehistoric sixties. It remains a super-fast recipe I often turn to when I’ve little time to fuss. The simple green salad I served with the salmon really needs no recipe. Simply whisk together 1-2 tablespoons walnut oil with a teaspoon of white wine vinegar. A smidgen of chopped shallots, or honey is a nice addition. Toss with 4 cups of loosely packed greens (I used arugula) and season to taste with kosher salt and freshly ground pepper. When a salad is this simple, I use the best oil and vinegar I can afford. The walnut oil was purchased in Kerrytown’s Fustini’s and the vinegar is an excellent imported French vinegar I had on hand. Here’s another almost instant recipe for baked fish requiring little more than opening a can of tomatoes! Preheat oven (I used my toaster oven) to 400 degrees. Combine mayonnaise and Dijon. 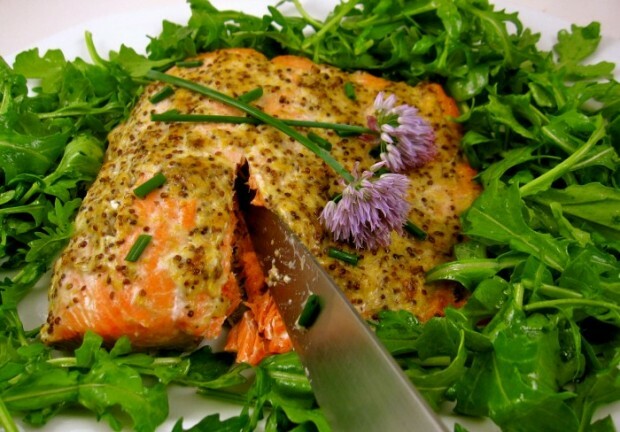 Place salmon and a foil-lined baking sheet and lightly season with kosher salt and freshly ground pepper. (Note: If you are limiting your salt intake, keep in mind the mustard lends a goodly amount of sodium.) Spread mustard-mayo mixture over salmon. Bake 8-15 minutes, depending on thickness of fillet and desired level of doneness, 8-14 minutes. Garnish with snipped chives and blossoms, if using.